These photos are two iconic moments in sports when elite Black athletes took a defiant public stand against racist violence in the US. As the “Star-Spangled Banner” played, the Black power salute was given by Tommie Smith & John Carlos, the gold & bronze medalists in the 200-meter track event at the 1968 Olympics Games in Mexico City. Peter Norman, the Australian silver medalist on the stand with Smith & Carlos, was in solidarity with their protest. (He died in 2006. Smith & Carlos were both civil rights activists who originally called for a boycott of the 1968 Olympics unless apartheid South Africa & Rhodesia were excluded from the games; Muhammad Ali’s championship boxing title was restored; more Black assistant coaches were hired; & Avery Brundage resigned as head of the International Olympics Committee. When the boycott failed to get support, they decided to participate & to make a political statement. Avery Brundage, who as an Olympics official in 1936 made no objections to Nazi salutes during the Berlin Olympics, suspended Smith & Carlos from the US team. As a result, Smith & Carlos received death threats & their careers as elite athletes took a big hit. On the other hand, till today, the oppressed around the world hold them in highest esteem. The second image is football player Colin Kaepernick kneeling during the pre-game “Star-Spangled Banner” to protest racism in the US, particularly police shootings in the Black community. Many other athletes are joining the kneeling protest in solidarity. There’s no question they draw inspiration from the defiance & fearlessness of Smith & Carlos in 1968. On Wednesday, Obama was asked by CNN about Kaepernick’s anthem protest. He said Kaepernick was “exercising his constitutional right to make a statement” but that he wished Kaepernick & those who joined him would consider the feelings about the American flag & anthem held by US soldiers fighting for our freedoms & “to listen to the pain” of those who have lost someone in combat. If you interpret Obama, what he is saying is that the misguided patriotism of soldiers who fight racist wars believing they’re fighting for freedom preempts the fury of the Black community for years of violence & undeclared war against them. Reuters reports that the Olympics Committee is offering Smith & Carlos “a long-awaited moment of redemption” by inviting them to a gala dinner in Washington, DC this weekend to honor the 2016 Olympic team followed by an audience of the team with Obama at the White House. The head of the US Olympics Committee has also asked Smith & Carlos to serve as Olympics ambassadors to bring more diversity & inclusion to the games. It isn’t “redemption” that this invite is all about since Smith & Carlos have never expressed a moment of contrition for protesting racism & human rights crimes. The invitation to the White House is almost certainly a maneuver. 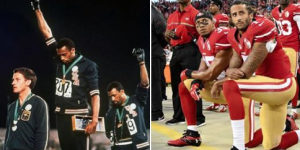 Is it conspiracy thinking to suggest that after 48 years of shunning Smith & Carlos, there is an ulterior motive having to do with discrediting the kneeling protest led by Colin Kaepernick?